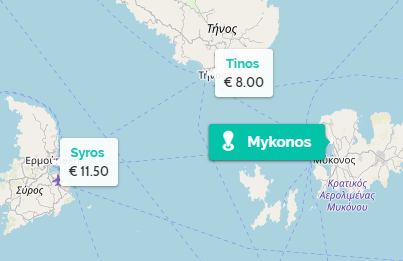 In our Greek island ferries map, you can visualize and plan your trip to the Greek islands effortlessly, and find the best prices for your ferries. Search for any island that you intend to visit. Use the search form on top or click on any of the pre-selected greek island ports, and start planning your trip. Immediately, the active ferry connections from your destination to any available location will appear on the map, showing the minimum ticket fares to each of these destinations. Find your second destination island and click on its marker. The map will now update with all the available ferry connections from this island to any other port in Greece. Each time you select a destination on the map, a box on the top left corner updates, showing the destinations included in your itinerary. As you continue clicking and adding islands, this itinerary will update. Overall, you can add up to five destinations. Once you have selected at least two islands for your itinerary, a 'Book' button will appear below your itinerary. By clicking on this button, you are redirected to our booking engine, with your island selections pre-filled. The only thing to do is select your travel dates and search for all available results for each leg of your trip. What ferry prices are shown on this map? In Greece, ferry connections between islands are not something that remains the same throughout the year. During the summer season, connections are more frequent and denser. During winter, on the other hand, only a few ferries remain to operate between islands. This map will show you the existing connections at any given time, including the minimum fare for ferry tickets for the current period.